As one of the most important City elections in recent years is about to take place on Tuesday, both Mayoral candidates – Republican Erin Stewart and Democrat Tim O’Brien have been showing what each is about during debates, press releases and past actions. It is time to take a final look at what each candidate has to offer. Both claim they will be fiscally responsible. Stewart has said one of her four priorities in the City is to restore fiscal sanity to the city, including immediately hiring a finance director. O’Brien claimed that he has turned the City around and held the line on spending. O’Brien pointed to consolidation of departments and claimed he did not raise taxes. Taxes rose on all property owners as values of homes decreased. Car taxes also rose as did business taxes. The budget rose by $25 million since O’Brien has been in office. O’Brien has also hired at least three new people in his office, several consulting firms and several people through HRA after forgiving about $5 million in taxes for HRA. Both candidates also claim education is key to the City’s future. O’Brien bonded $2 million for school books and gave education about $200,000 more this year in funds. He takes credit for an additional $4 million in state funds which he played no role in acquiring. Stewart, a member of the school board, has been a big supporter of new Superintendent of Schools Kelt Cooper and his new plans. 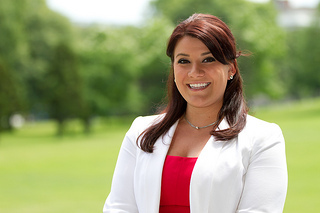 She is a product of New Britain schools graduating from Central Connecticut State University (CCSU). O’Brien grew up in Manchester and took a few classes at CCSU. Blight has become a big issue for both candidates. O’Brien said his administration’s anti-blight policy is “strong,” citing the dilapidated Berkowitz Building as something that should be converted and put to use. Stewart believes that O’Brien’s idea of fighting blight was often a quick way for the city to get involved in small disputes between neighbors who may just be arguing over downed branches or overgrown grass. In the past year O’Brien said he has tried to fight blight by taxing landlords for various issues. This has resulted in a battle that landlords said would lead to higher rents for tenants. O’Brien has refused to speak to landlords and also proposed a resolution to charge 911 fees for property owners whose tenants make many phone emergency (not medical) calls. Several bills have been proposed at the state level in order to stop possible dangers to residents. One woman in Pennsylvania was badly injured due to fear of calling 911. Stewart said she is willing to work with landlords on blight issues and will not support fees on any property owners or tenants. Residential input is a topic Stewart has focused on saying she would welcome visitors. Stewart plans to re-instill office hours so residents can come and talk to her at any time. O’Brien has claimed residents can talk to him at any time, but various residents have stated they were only able to reach one of his staff members and not O’Brien directly. In the past year O’Brien’s decisions have been under question virtually each week by residents. During one of the recent debates each finished with the following statements.